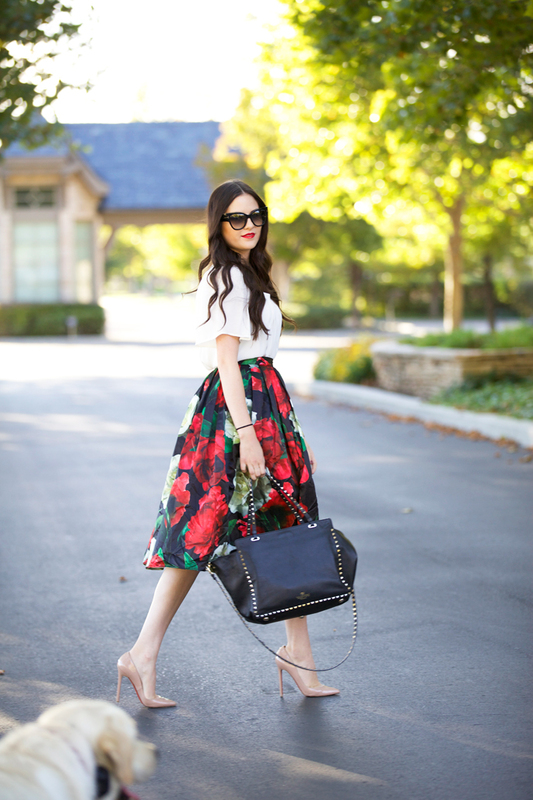 You all know I’m a sucker for midi skirts and this one from Chicwish is no exception (especially because there are peonies on it). I love how feminine and flowy it is… It made for the perfect romantic look! The skirt looks so amazing! Love it. That skirt is a dream! Beautiful skirt! and you’re lookin gorgeous as always. Love this look! So beautiful and feminine! SO pretty! great colors on you! Awwww, the adorable DasherBoy has made another appearance on your post today. Such a sweet and heartwarming every time, it just speaks so much volume of a bond between human and their best of their furry friend. Wow that skirt is amaziiing and you look lovely in it! Would love to wear this look! I’m another sucker for midi skirts and I’m mildly obsessed with this one! Gorgeous! Ohhh that skirt is so gorgeous! Love the pics with Dasher! I really love this looks, it’s so feminine and romantic! This skirt is an instant eye-catcher! This skirt looks perfect on you! Adorable dog! 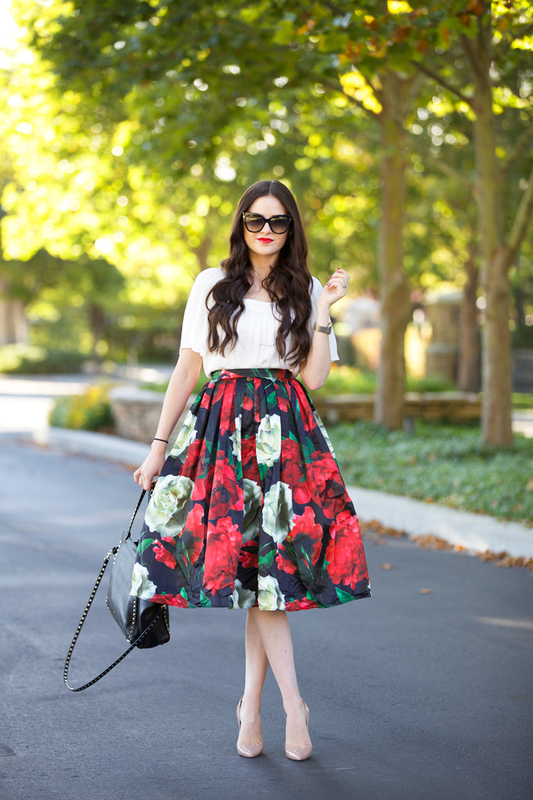 The print of this skirt is fantastic! You look gorgeous as always!! Rach, you never cease to amaze… that skirt is absolutely breathtakingly romantic! Gorgeous, gorgeous!!! Your skirt is beautiful! This is such a romantic look. I love how dramatic and bold this skirt is! That skirt is so pretty and looks great on you! 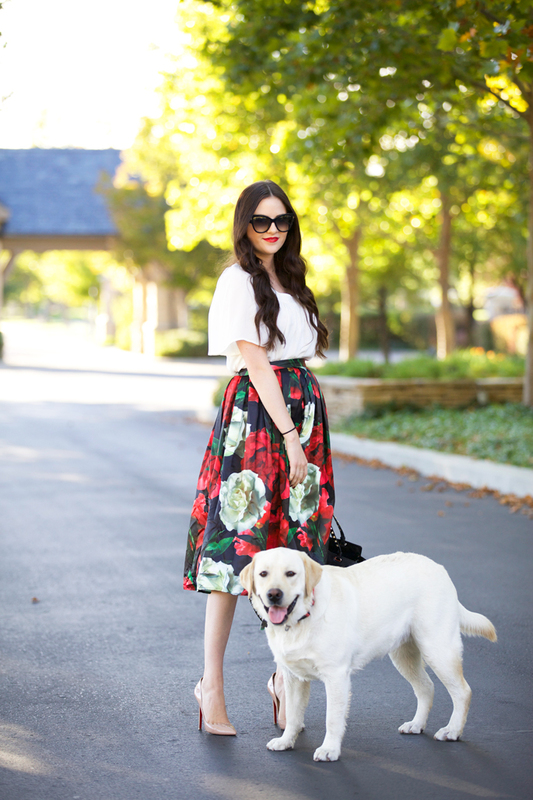 I love how a full printed skirt can add so much style to a look! You look fab, and so does Dash. I can totally see this skirt being “holiday-fied” with tights, scarves and darker richer colors! Love it so much!! Very Valentino-esq! Super girly and fun! BEAUTIFUL!! Love that skirt and everything else about that outfit. Such a beautiful and romantic pairing, Rach! I love how you paired the skirt with a simple top and red lip, it really allows for the skirt to be the star of the show! So obsessed with that bag! Ah! Gorgeous skirt! 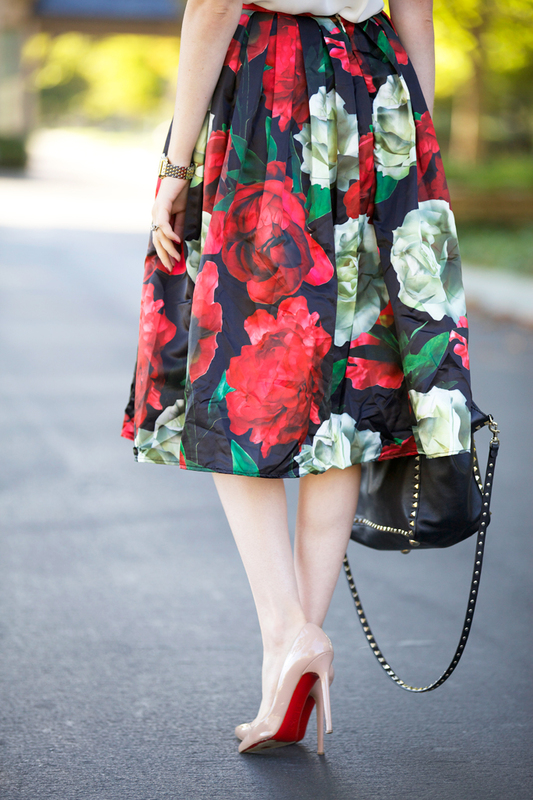 Love how you incorporated florals for fall! I love this look! It’s so dramatic yet classic. Very pretty! Beautiful look.The skirt is amazing! Yes, love!! That print and fit are amazing! such a perfect skirt. gorgeous on you. Such a gorgeous skirt! Love the darker floral pattern!! 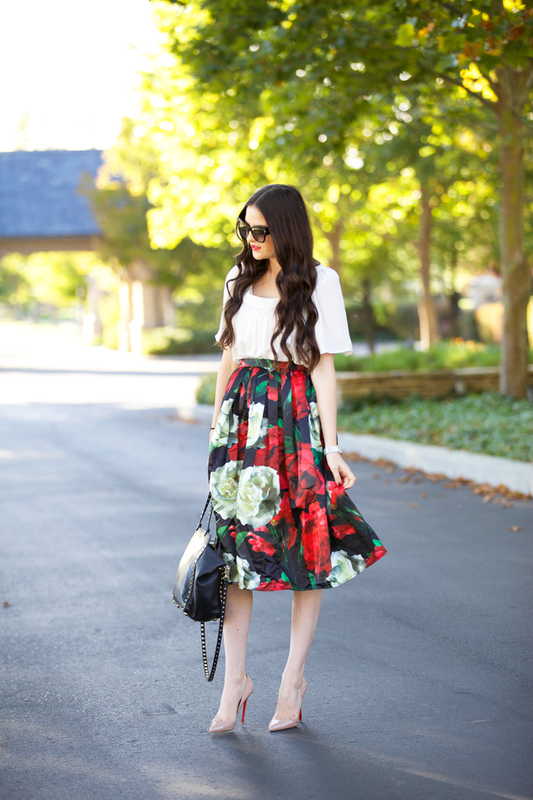 I love the silhouette of the whole outfit and the bold colors and pattern of the skirt! Love how affordable that skirt is! And love those shoes always! Love this skirt! Love the print, perfect transitional piece from fall to winter! I love love love that skirt! You are looking beautiful as always!